Leeds United’s long wait for a penalty finally ended and it proved a crucial one as they came from behind to make it four wins on the spin with a 2-1 success against Queens Park Rangers. Kemar Roofe put the early second half spot kick away with authority to add to his injury-time first half goal as the Whites’ victory enabled them to open up a five-point gap on the team in third place in the Sky Bet Championship. Leeds fans had not seen a penalty awarded for their team in the previous 58 matches - a run going back almost 15 months so the cheers that met referee Peter Bankes’ decision seven minutes into the second half were loud and long. It was Roofe that won it as he tried to control a clever chip over the defence by Pablo Hernandez and the ball was adjudged to have hit the hand of defender Toni Leistner. The Rangers skipper protested the decision, but to no avail and Roofe won an argument with Hernandez to take the spot kick and confidently hammered the ball into the bottom corner of the net. It turned out to be a tough afternoon for United, but they started well and could have been out of sight in the first 20 minutes. Roofe, who bagged a hat-trick against QPR last season, could have opened the scoring in only the second minute as he met a good ball in from impressive young right-back Jamie Shackleton only to shoot wide with a near post effort. Hernandez was unable to make the most of an opening a minute later after another good run and cross by Shackleton and Ezgjan Alioski’s low ball in from the right just evaded his strikers in the six-yard box. Hernandez came close with a shot that was heading goalwards until unluckily hitting teammate Roofe. Another good chance went begging when the ball fell nicely for Roofe in the area, but his first time effort was tame and keeper Joe Lumley was able to save comfortably. The visitors finally offered a threat as Eberechi Eze benefited from some sloppy passing by the Whites and his 20-yard shot was well held by Bailey Peacock-Farrell. Rangers stunned the home crowd, however, on 26 minutes as a hopeful long ball forward caught out stand-in defender Kalvin Phillips. Although Pontus Jansson came across to cover his attempted stooping header failed as livewire striker Nahki Wells nipped the ball away from him and confidently beat Peacock-Farrell with a low shot. Leeds’ thrilling football of earlier suddenly dried up until they also got a goal out of the blue in the fourth minute of first half injury-time. After a Shackleton cross was only half-cleared Hernandez threaded a great low ball through for Roofe to score with a deft flick and make it all square at the break. The Whites started the second half as they had the first with Hernandez shooting over from the right edge of the box and then scoring their winning goal. They could have had another within two minutes of the second goal as Roofe’s shot was just tipped wide following a great run forward by Jansson. Alioski’s long range shot was saved by Lumley before Roofe had a great chance for a hat-trick when Samuel Saiz sent him through one-on-one with the keeper only to see his shot from an angle saved. Wells blazed a decent chance over for the visitors as they reminded everyone they were still somehow in the game, but Shackleton went on another good run at the other end only for his shot from an angle to go over. QPR went into plan B mode for the final 15 minutes with former Leeds striker Matt Smith sent on to add to some height to their attack. They suddenly began to dominate and Wells fired an angled shot not far wide before Freeman headed over. Mateusz Klich sent two strikes over for the Whites when it looked better to have passed to unmarked teammates, but Rangers forced lots of late pressure with high balls into the box. Leeds, with Aapo Halme sent on to help the defence, survived, however, the only alarm being a Jake Bidwell lob that was turned over by Peacock-Farrell. Head coach Marcelo Bielsa reckoned his United were good value for their win. He said: “The first part of both halves were very good. “In the second part of the first half we suffered the effect of conceding the goal and at the end of the game we did not have any other option but to adapt to the kind of game the opponent imposed. “We had too many tall players in our box so we had to solve this problem and as we were only winning by one goal the result was at stake. “I think we played well. “When the opponent scored they increased their level of play, but they couldn’t create any chances to score. “At the end Queens Park Rangers dominated the game, but through different paths. “It’s very difficult in the Championship to win four games in a row and it is also difficult to be deserving to win the games. These 12 points come after an important loss and this allows us to forget this feeling of having lost by such a difference. 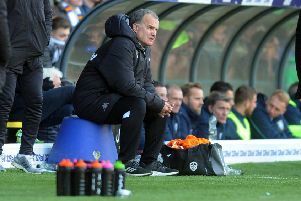 Bielsa was pleased with the display of youngster Shackleton who was drafted in at right-back with the team having five full-backs injured. He said: “When we dominated the game he was influential. QPR manager Steve McClaren was not happy with Leeds’ winning goal from the penalty. He said: “It was poor decision for the penalty, I think, and it’s cost us the result. “The player’s adamant that it has not touched his hand and with the referee’s position he would have to have great eyes to see that. He was probably influenced from behind the goal. “But I’m proud of the players’ performance and they way we fought back. We deserved more than we got. McClaren felt Leeds are in good position to push on for promotion. He added: “It was a strange league to start with and was very even and now we are seeing six or seven teams start to come through. There’s a lot of big clubs with big expectations. “It’s who handles the pressure the best and Leeds are going to be up there without a shadow of a doubt. Leeds: Peacock-Farrell, Shackleton, Jansson, Phillips, Douglas, Forshaw, Hernandez (Clarke 86), Klich, Saiz (Halme 81), Alioski, Roofe. QPR: Lumley, Rangel, Leistner, Lynch, Bidwell, Cameron (Scowen 45), Luongo, Wszolek (Osayi-Samuel 75), Eze (Smith 78), Freeman, Wells.